In our excitement to inform you of all the latest news and events, there were two items that we did not have the most up-to-date information on - please see the two highlighted areas below. Thank you. We will remember the summer of 2016 and the excitement of the Republican National Convention being held here in Cleveland. The League didn’t take much of a break this summer, but the Board didn’t meet in June and some of us relaxed for a bit. However, no more! With the 2016 Election approaching, we are gearing up for an exciting Fall. As a prelude to what you can get more details on as you read through this Voter, I want to highlight (a few drum rolls/shout outs to our Committees) what the League has planned in the lead up to the election. Our Voter Service Committee will be registering voters at the September 17 Football Game at Shaker Heights High School. We will also be at the final beer garden in the Van Aken District on September 9 after being at every beer garden this entire summer! Additionally, we will be in the dining halls of Case Western Reserve University in the run up to the voter registration deadline (October 11). The Legacy Committee has selected our 2016-2017 Legacy Fellow, Ose Arheghan, who is a rising junior at Shaker Heights High School. Ose will be helping the League with programming aimed at engaging students in the civic process by holding forums, mock elections and serving as a liaison between the high school, the League and the community at large. We are very happy to have her on board! If you would like to learn more about her, take a look at her web page. 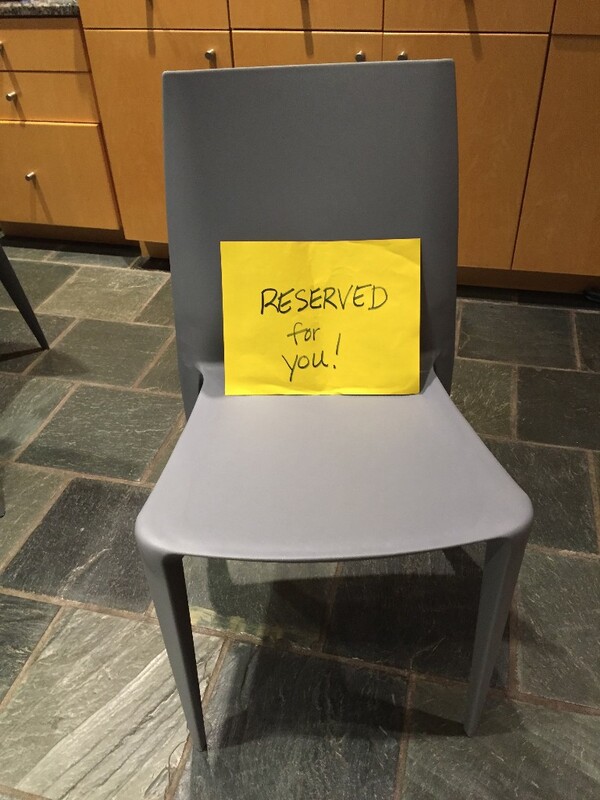 Observer Corps – this is a group that helps us make sense of all the issues facing Shaker Heights and the region. Members have volunteered to attend and report on various City Boards and Committee meetings (check out the links and find out what’s been going on). There is much happening with the schools and the library, and the League is vested in learning about the proposals that will be coming this year. We can always use more help, so if you’re interested let me know! The Forum Committee will be hosting a Candidates Forum on September 22 at Brush High School with candidates for Ohio House Districts 6, 8 and 9; Senate District 24 and the Ohio Board of Education, District 11. We are also co-sponsoring a forum at the Flora Stone Mather Center for Women on October 4, “Represent: What Are You Doing on Nov. 8th?”, which will be a discussion on what’s important to young adults in this coming election. This is in addition to the Northeast Ohio Policy Series forums that will highlight topics such as the water quality of Lake Erie, Sports Stadium financing, marijuana legalization and the relationship between Cleveland Police and the community. This is what we do for our members and our community. If we want to make democracy work, we all need to participate. Please come and join us at these events and forums as well as volunteer your skills and learn with us. We are very sorry to share the sad news of the loss of Kim Diemert, a beloved friend, colleague and member of the League's Shaker Chapter. There are lots of opportunities this Fall to help voters register in time to vote on November 8. The last day to register is October 11. 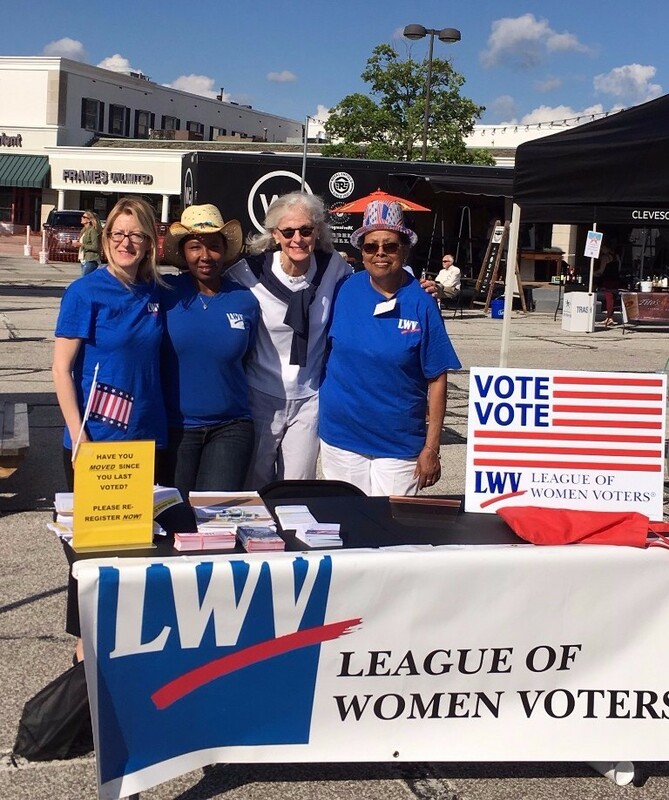 The League is staffing voter registration tables at many events. If you'd like to help, contact Audrey Morris at ajamorris@gmail.com. With the assistance of the LWVGC and several other local leagues, we are hosting a Candidates Forum. Last year we raised more than $600 for LWVGC-SH from Heinen's Teaming Up for Education Program - and it's time to sign up again this year - then up to 1% of your qualified purchases from September through April can be donated to our chapter. Log into your Tasteful Rewards account at www.heinensrewards.com. Click on "My Profile" just below the top of the page. Scroll down to the bottom and select LWV-SH, then Save the Changes. You may also register by going to the service counter at any Heinen's. It's a great, easy way to raise money for our League Chapter! The panel will address the vital water issues in Northeast Ohio, specifically Lake Erie, the Cuyahoga River and other creeks, streams and rivers that empty into the lake. September 15, 7:00 - 8:30 p.m. Represent: What are you doing November 8th? October 4, 5:00 - 6:30 p.m.
LWV Ohio has an All-Member Conference Call on the first Tuesday of each month. All League members are invited! Topic: Hear about the Ohio Voting Rights Coalition's voter engagement plan to address voter purge, Election Protection Observers, and GOTV efforts from now thru Election Day. The call will also provide an opportunity to the local Leagues to discuss their voter service plans, and publicize any opportunities available for volunteers to sign up. The recording of the all-member call will be available following the call until the end of each month. Please note that the podcast is intended for LWV members and guests (just like the calls) and, therefore, should not be shared with anyone outside the League family. To listen to the recording, click here and enter passcode: lwvohio. 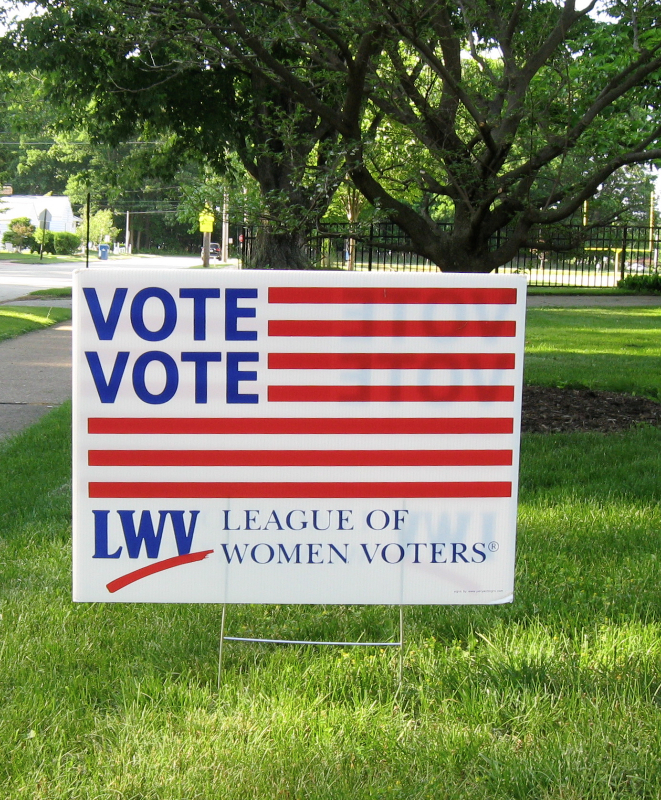 The League of Women Voters, a nonpartisian political organization, encourages the informed and active participation of citizens in government, works to increase understanding of major public policy issues, and influences public policy through education and advocacy. Dedicated volunteers at a summer Van Aken District Beer Garden. Thank you to everyone who has helped! We can always use more observers and substitutes! Please contact Marcia Goldberg if you are interested in serving on the observer corps. No experience needed - just a willingness to serve the League by attending a meeting periodically and writing up minutes. Marcia will train new volunteers. Friday, Sept 9, 9:30 a.m.
Saturday, Sept 17, 9:15 a.m.
Friday, Sept 30, 9:30 a.m. If you want one of these signs for your yard, contact Audrey! According to Secretary of State Jon Husted, between 1.5 million and 2.3 million Ohioans are eligible but can't vote because they are not registered. Over 360,000 Ohioans need to update their address. Let's get started with simple moments of connection with others at our registration locations. All training sessions last l l/2 hours. Our non-partisan sessions are easy, sociable and a great way to pick up materials, meet registration partners, and sign up for registration locations. Given the results of our turnout research, we've made some changes in training content. Contact Susan Alcorn for more information. Register online . LWVGC board member or chapter chair.